During my PhD I was responsible for a network of seven seismometers stretching from Ireland to East Anglia: the British Isles Seismic Experiment (BISE). A number of these instruments are still in operation, with HLMB part of the British Geological Survey's Seismic Monitoring network. Each seismometer was a Güralp 3TD seismometer, connected to a DCM for data recording. 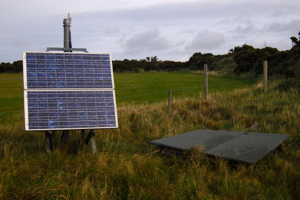 Seismometers were powered by two 30W solar panels if in a remote location. See the map page for seismometer locations, along with others in North West Europe. 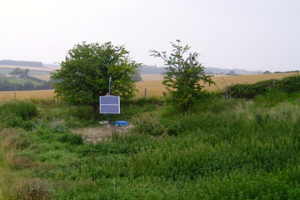 Seismometer APAB, at the far east of the network, was installed near Peasenhall in Suffolk. The pit was beside a BGS short period instrument (APA) with the solar panels and GPS attached to the BGS telemetry post. 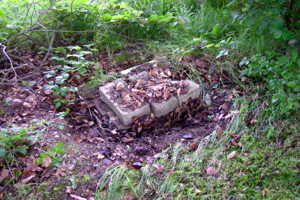 The installation was in soil as there is no shallow basement rock in that area. Seismometer CKWD was installed at the far west of the network, on the edge of Lough Derravaragh and near to the small village of Crookedwood. CKWD suffered a number of timing drifts with the GPS unit not working correctly but these problems did not affect the receiver function study. 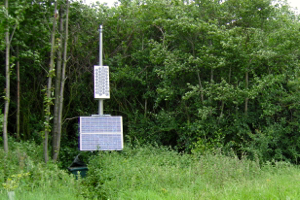 Seismometer DEND at Dane End in Hertfordshire was the closest seismometer to London. DEND had more than one deployment due to solar panels being stolen at the first site. The final and longest deployment was located on the edge of a disused chalk quarry in arable farm land. 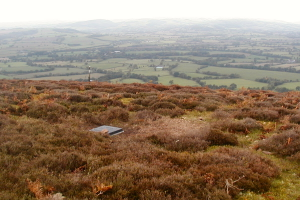 Seismometer HLMB on Long Mynd in Shropshire was installed close to the BGS short period instrument HLM, on moorland owned by Midland Gliding Club. HLMB was installed in collaboration with the BGS and live data is streamed to Cambridge and Edinburgh for monitoring. 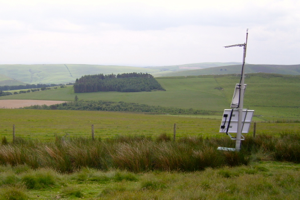 Seismometer IOM was installed on land owned by the Isle of Man Astronomical Society, near the village of Foxdale. The site was important, being the only station in the Irish Sea and is situated near the centre of the island to reduce seismic noise. 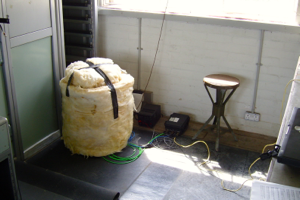 Seismometer MRAO was installed at a disused control room for one of the radio telescopes at the Mullard Radio Astronomy Observatory (operated by the Cavendish Laboratory Astrophysics Group) situated at Lord's Bridge to the west of Cambridge. 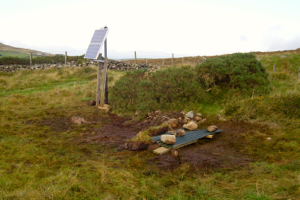 Seismometer SLNM was installed near the summit of Slievenaman, in the foothills of the Mourne Mountains in Northern Ireland. The deployment was located on farmland to the north of the Mourne granite, directly on basement country rock and was the last seismometer in the BISE network. An eighth seismometer was installed beside the BGS short period instrument SBD, on moorland above the Ceiriog Valley in north Wales. The seismometer and data recorder were stolen and therefore the remaining equipment was uninstalled and no data was retrieved.